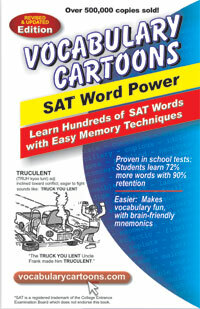 When my copy of Vocabulary Cartoons SAT Word Power came in the mail, I suspected trouble. Why? I already owned an older version of it and it was still summer break. My older copy had sat dormant in my sunroom for a while. When you live five minutes from the beach, you rarely do 'school' in the summer. These two strikes could make for a difficult review. Thankfully, I was wrong. This book is not very 'schoolish'. I am not in favor of teaching to the test, but usually prefer learning vocabulary naturally in the context of a great book. This little book makes learning vocabulary fun. Each new word is accompanied by a funny cartoon with some word play in it. This was right up our alley. I am sure Charlotte Mason would have appreciated the gentle short lessons of this book. I just learned a new word, irascible, which I will try my hardest not to be. You can view more samples of Vocabulary Cartoons here. Random, who masters the quizzes easily, likes it. He surprisingly informed me he has never liked vocabulary. I take this as a high compliment for Vocabulary Cartoons. Paperboy's first experience with Vocabulary Cartoons shocked me. I assigned him a chapter from the middle of the book. He took it into his lair and returned quickly. He handed me the book and said: "I love it, let's keep it." "Did you even read it?" "Yes, of course I did." On Monday, I orally quiz them on the words in the chapter, just to see if they already are familiar with them. At times, they surprised me and knew a few. They read the first chapter through once. On Tuesday, they reread the chapter, focusing on the example sentences. I want them to understand the words in the context of how they are used. On Wednesday, I orally quiz them on all of the words. On Thursday, I give them the quiz in the book. I photocopy it. If they score 100%, they are done for the week. On Friday, they fix their quizzes, if needed. The quiz consists of 20 questions matching the definitions and filling in the correct vocabulary word. Although the quiz is fill in the blank, it does require some extra effort. The student must change the tense of the verbs to agree with the sentences. The boys are learning to handle the words and memorize the definitions. Vocabulary Cartoons fit in with my children's learning styles. The visual, a great cartoon, evokes giggles. The words are in alphabetical order. This is the one thing that confused my children. When they were introduced to 7 words that have the same 2 or three letters, they mixed up a few of the words. This program takes 10 minutes a day at the most. If your child is nearing SAT time, you could surely assign 40 words a week and finish the books in 5 weeks before moving on to book 2. Our method works nicely with our workbox system as it is one of their lighter assignments. If you already have vocabulary in your curriculum, I would still encourage you to purchase this book. Leave Vocabulary Cartoons in the back of your car, in the bathroom(eew) or on the coffee table. All ages will appreciate these cartoons. You can see what others are saying about Vocabulary Cartoons here. Because I already owned this book, I need your help. Help me not to hoard books. My friend, who shall remain nameless, is slowly weeding out her vast collection of home school books. I was the benefactor of her kindness a few years back. Now I have an extra copy to give away to one lucky reader. To win this book, you must leave a comment using my new word irascible correctly in a sentence. Tweet or share this on Facebook and leave me a comment for each one you are doing. Another Extra Entry: Boost my self esteem, follow me or let me know you already do. 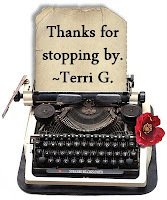 Make sure I can contact you through your blogger ID or leave your email in the comments. I will pick one lucky winner on September 24th. If you don't win or have time to enter contests, head over to New Monics, Inc and see these great books yourself. I received a complimentary copy of this book as a participant in the 2010-2011 TOS review crew. The opinions are my own and of course my children's. This give away is closed, congratulations to the winner! She has received her book and loves it! I am following you!!! Love the new colors!! 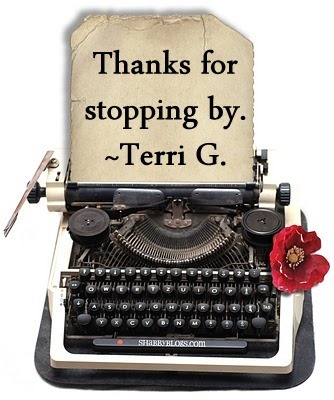 Thank you so much Terri. As soon as I finished reading I went and ordered the elementary version, I know this is just the thing for Sam. (I will save the fancy new word for later, as I don't need to hoard books either.) Thanks for something so fun! His consumption of alcohol often causes him to exhibit irascible behavior. You know I follow your blog, and I learn sooo much in doing so!! I will tweet about this, for sure! selves. Plus all of my extremely long life I have always loved vocabulary! I became irascible at the thought of not winning this cool book! When my boys were younger, they were irascible whenever a Lego structure fell apart. This would be a great supplement to our homeschool - and we LOVE cartoons and humor, especially when there's a purpose. I shared in on FB too! Yeah Jenny: It's my blog and I can make the rules and break them. Consider this your entry. I too am purging old school books, but this looks like something my kids would love.